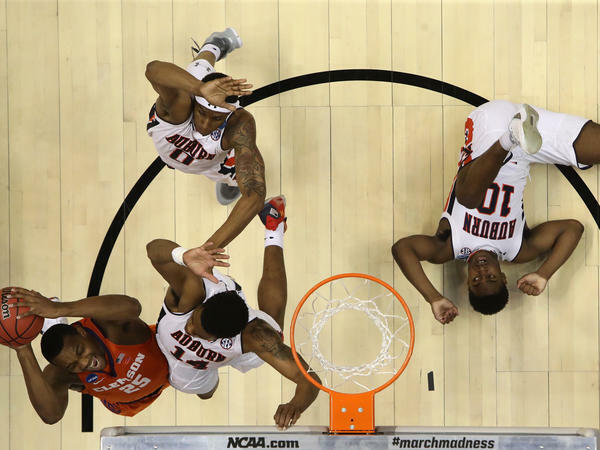 Clemson's Aamir Simms (25) shoots against Auburn's Malik Dunbar (14) during a second round game of the 2018 NCAA men's basketball tournament last week. The NCAA will make $771 million from this year's tournament. "I wanted ... to get the NCAA to at least admit that they were wrong in using former players likeness for profit, and that eventually branched off into current players owning their likeness and why they should," O'Bannon said to me on the Code Switch podcast. "Then it branched off later into actual current players getting paid from the universities and from the NCAA — not only basketball and football, but all athletes. Men and women." The NCAA will make $771 million from the NCAA men's basketball tournament this year. The coaches at the biggest basketball schools have average salaries of around $3 million. But most Americans are not on board with the idea that the men who play the games should be paid. Ekow Yankah, a law professor at Cardozo Law School in New York City (and a huge fan of University of Michigan sports), offered a somewhat counterintuitive take on all this in a New Yorker essay, "Why N.C.A.A. Athletes Shouldn't Be Paid." Yankah believes the current system is unfair and rife with exploitation, but believes that paying college athletes would essentially just entrench that arrangement. Below is an edited version of our conversation with him on the Code Switch podcast episode, "The Madness of March." Walk us through what you think might happen if we paid college athletes. I think paying college athletes is almost certainly bad for the athletes, terrible for the universities and terrible for the sports they play. Other than that, it's a great idea. There's very little reason to think that a young athlete's life will be in any substantial way better if they become, so to speak, employees of the university. Of course, many of these young men are under tremendous financial difficulty. I understand that a good number of them come from backgrounds which are difficult or even impoverished, and I'm well-aware that the demands of big-time college sports, but almost all college sports, are so consuming that there seems something unfair about their having to balance these two projects. The problem is that paying them doesn't help relieve that stress, paying them only makes it the case that that stress seems justified. Paying college athletes will almost certainly exacerbate a problem that has been going on for generations, where athletes of a certain number of sports are seen as ever more divided from the actual student body. They're seen as tangential. They're seen as not real students. And, indeed, given that they will then have to trade some of the minimal protections that they have as student-athletes in order to simply be employees of the university, at least in some capacity. It seems like a pretty raw deal. All of this, by the way, is in exchange for what it would actually be, for the vast majority of athletes, a remarkably small amount of money on the free market. You're saying that the best players would get the most money, but most players would get a pittance, if it was not equalized. The point is that it's awfully hard to project which kids will be superstars. So outside of the small number of "can't-miss" prospects, most kids will actually be paid on some scale that reflects the deep uncertainty about how good they'll be. And if we want to see what that looks like, we don't have to use our imagination. We can look at the minor leagues: minor league basketball, minor league baseball and minor league hockey. Most of these young people are working nonstop. Most of them are just as talented, if not more talented, than the vast majority of college athletes. Most of them are paid roughly what a Starbucks barista is paid. And in exchange for all that, they give up their opportunity to go to college, to pursue their dreams and to turn out to not be a 20 year-old superstar but maybe a 40 year-old functioning adult. You say that there is a racial component to the way that people think about the minor league systems, and the prospect of paying student-athletes in men's basketball and football. One thing I worry about is this argument that, "Well, these students aren't really students, anyway. So let's just pay them." And I do think that has a racial component. It's not entirely racial, of course. Part of it is that people are well-aware and turned off by the huge financial incentive that the universities have. But it's also true that there are a ton of different students on every college campus who are not straight-A math students. Somehow when we think about young black athletes and what they do, the sort of physical talent that they bring is not valued the same way that the ballerina's is or the chess player's is, or the musician's is — and I do find that worrying. I wonder why it is that these are multitalented people whose skills may not be at its highest in science class is so quickly dismissed. It's very clear that the true developmental league of the NBA is currently college basketball. The true developmental league of the NFL is entirely college football. And, somehow, the answer seems to be, "disconnect these students from education" rather than, "why don't we do what we do with other sports and set up a robust semi-pro league?" One that would allow some students, those who are actually involved and engaged, to remain student-athletes and allow those for whom being a student-athlete has no part of their project to go on to do what they want to do. But it seems like even with that system [where minor leagues for football and basketball exist alongside the traditional college system for those sports], there's still a lot of kids who have no illusions about the fact that that they're not going to go pro, who will go to college, who will try to make the most of their college experience and will still generate tons of revenue for those colleges while they personally struggle financially because they can't be paid. I'm just curious what happens to those kids. I think that's a great question, and it gets the heart of how complex and hard this is. If you're a student-athlete who comes to Michigan well-aware that you're never going to professional, then there's a real sense in my mind's eye that you will make the deal that makes being a student-athlete worth it. That is to say, that your education will actually be valuable to you in a way that matters. You'll be much less likely to be fooled or to trade on these fumes of dreams that allow school after school to give college athletes empty classes with no value that end up with empty degrees with no value. I am not interested in a bunch of young men who work for three or four years for a university making a minor league salary, which, if people actually looked at what that would be, is quite minimal. I'm interested in the next generation of doctors and lawyers and bankers. And in particular, for the sports that are dominated by African-American men, I'm deeply interested in the next generation of black doctors, black lawyers and black bankers, rather than kids who are seduced into trading that for making spending money from 18 to 22.